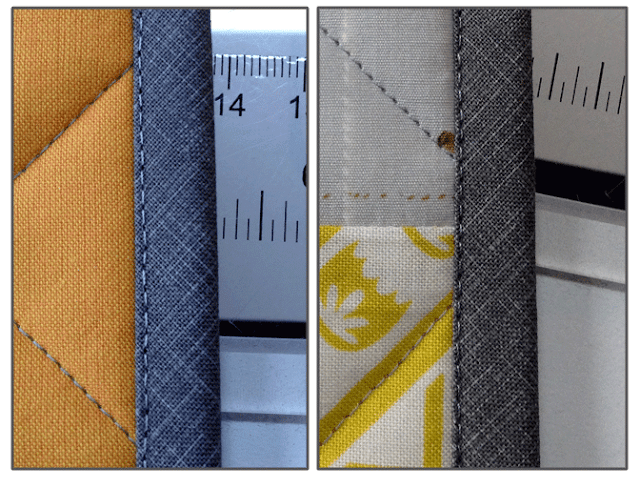 Today I am sharing with you my 3 methods for machine binding. Hopefully you'll take away a skill that will help you finish a few of those projects with ease while creating professional results. On so many occasions ladies come into the shop and while taking a look at all the samples (over 1000!) the most commonly asked question is how our bindings are so neat and even on both sides. So, today I'm spilling the beans on my bindings....tricks I talk about in the shop almost daily. The first thing I can tell you is that all of our binding are cut on the bias. Not only does it hold up longer because of having two fibers in a 'X' running the length of an edge, but it also hides any discrepancies because its so pliable. When binding a scallop quilt or apple core quilt its a must to prevent any bunching. •I cut most all of my bindings at 2.5" then use a 3/8" seam allowance for application. •I also always use a walking foot (and most of the time while sewing too!) and a Schmetz Microtex needle or any 'sharps' needle. •As a rule of thumb when top stitching you're suppose to lengthen your seam, so while applying bindings I use a stitch length of 3 for the final step. 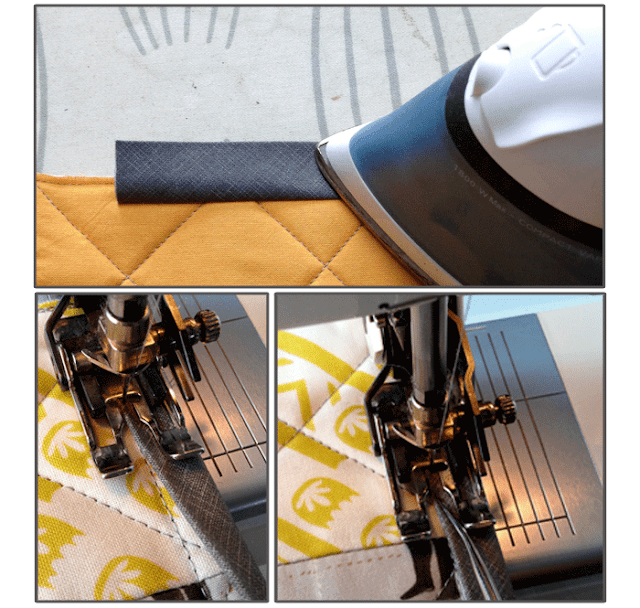 Method 1: Only seeing top stitching on the front of your quilt. I like not being able to see my seam from the back (left picture). Some ladies like to be able to see top stitching evenly on both the front and the back and not have the seam to the inside of their bindings. Method 2: Even top stitching on both top and bottom. To do this I apply my binding to the back first, using a 3/8" seam allowance like before. Now I use this method when I don't want the bulk of a binding to deal with, normally on small projects like mug rugs, reader wraps, etc. 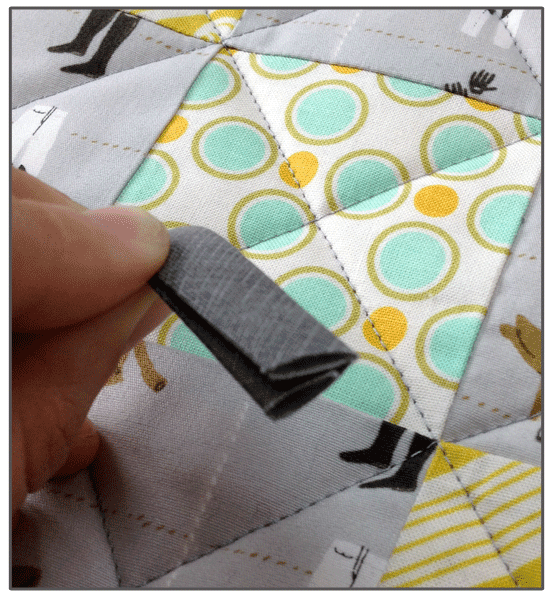 Apply binding to the back of your quilt, using only a single layer, follow the first crease which is about 3/8" seam allowance. Once you pull the binding to the front, your binding should snap close, hiding the remaining raw edge. You can use either your awl to pull it and hold it while you sew or place a few pins around to secure while you stitch. You can choose to pull the binding further over the seam like in method 1 or choose to have both sides top stitched like in method 2. This is purely aesthetic and totally up to you. Wow! I am so ingrained in the traditional method which includes hand sewing so this is a new trick and will take some practice. Good to learn new ways of doing these tasks. Thank you. Hiya, I think I can help. A tailor's awl or stiletto is just a pointy stick that saves your fingers from the sewing machine needle or iron; quilter's use it to grab and adjust fabric as they stitch to prevent it from shifting, or to push a thick joined corner through smoothly and accurately. Loved reading this! Thanks for taking the time to share with all of us! Wow Wow! Binding perfection like I've never seen before! Thank you. 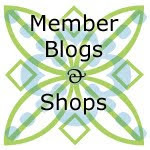 Gorgeous post and terrific info! Thanks! Thanks for the beans, Steffani! Fantastic info. I have been too chicken to try but maybe this will push me offa my roost and give it a go. Thanks for taking the time to share this.